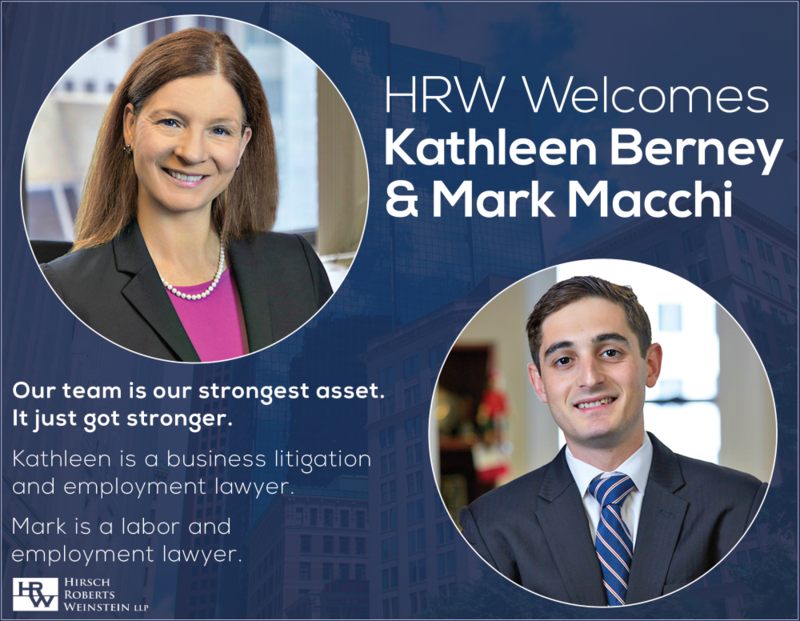 Hirsch Roberts Weinstein is pleased to announce the arrival of our two newest attorneys, Kathleen Berney and Mark Macchi. Kathleen Berney is a business and employment litigator who works efficiently and effectively to help clients resolve their most challenging issues. Both in and out of the courtroom, Kathleen draws upon her experience as in-house counsel at a large corporation to help clients avoid or remediate problems or risks. Kathleen has experience conducting internal investigations, as well as representing companies in government and administrative agency investigations. Mark Macchi is a labor and employment lawyer. His practice involves advising employers on a variety of matters, including wage and hour compliance, discrimination, termination, and personnel policies. With respect to traditional labor law, Mark advises clients on the diverse issues that may arise under a collective bargaining agreement. Mark has experience with negotiating collective bargaining agreements, processing grievances and labor arbitration, and unfair labor practice charges. Hirsch Roberts Weinstein is a premier Boston litigation, labor, and employment law firm. Click here to learn more about our team.